Gary Freear was in good form for Wisbech. Not for the first time in his long illustrious career, Gary Freear led the way for Wisbech in the big Cambs League derby against fen rivals March yesterday (August 26). Freear opened the batting for Wisbech and helped himself to 76 runs off 98 deliveries, clouting 10 fours and a six. That steered Wisbech to a tasty 246-8 off 50 overs with Danny Haynes (37) the next best contributor. Veteran Chris Ringham was March’s most sucecssful bowler with 2-36. March were then despatched for 162 with number 10 batsman Lewis Welcher their top scorer with 34. Jonathan Garner was top Wisbech bowler with 4-29 and Parth Patel took 3-18. There was a shock defeat for table-topping Ketton who went down at home by 31 runs to fifth-placed Saffron Walden. The visitors were bowled out in 49.2 overs for 223 but then Ketton suffered a top order collapse in reply and were in trouble at 33-4. Zeeshan Manzoor came to the rescue with 78 and Mitchell Thomas hit 32 but it wasn’t enough and Ketton were bowled out for 192. Ketton still lead the table by 14 points from Ramsey, who beat Foxton by 30 runs. Ryan Smith hit 64 for Ramsey as they were bowled out for 220 in 49.3 overs and then Foxton were dismissed for 190 with Isaac Love taking 4-28. Nassington suffered a crushing 10-wicket defeat at Waresley after folding for just 71 in 22.2 overs. Only Conor Craig (38) managed to reach double-figures. 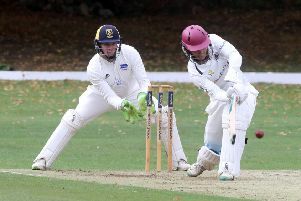 In Division Two, Castor were 43-run winners against Blunham. Cameron Dockerill scored 50 out of Castor’s 162 all out and then Joseph Higgins took 3-16 as Blunham went for 119. Ufford Park were second best at table-topping Sawston & Babraham, who made 284-4 batting first. Ufford’s reply was 160 all out of which Ross Keymer made 79.